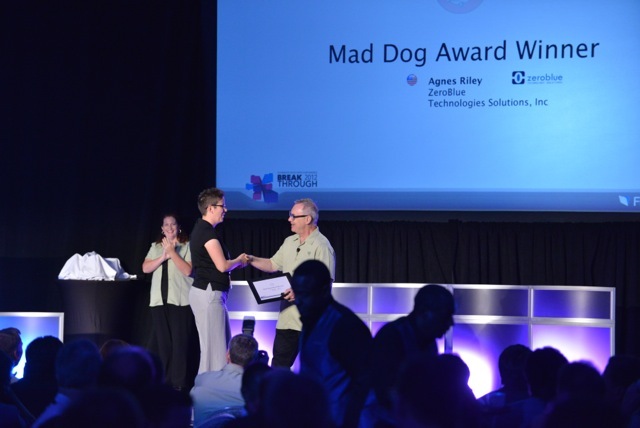 FileMaker Public Relations awarded one of this year’s Mad Dog Awards to Agnes Riley of ZeroBlue at the FileMaker Developers Conference in 2012. This is the second Mad Dog Award for Agnes Riley two years in a row. The winners, representing the U.S., Europe, and Australia were acknowledged for their contributions in promoting awareness of the FileMaker name in the media and social media. Agnes Riley has been at the forefront of communicating FileMaker news, writing blog posts and promoting the FileMaker name. Winning this award again is a recognition by the industry and FileMaker, Inc. of our hard work. Thank you, Everyone for reading the blog and Facebook posts and tweets.